Known as the "Voice of the National Weather Service," the National Oceanic and Atmospheric Administration (NOAA) Weather Radio is provided as a public service by NOAA, a division of the Department of Commerce. NOAA Weather Radio includes more than 985 transmitters, covering all 50 states, adjacent coastal waters, Puerto Rico, U.S. Virgin Islands, and U.S. Pacific Territories. 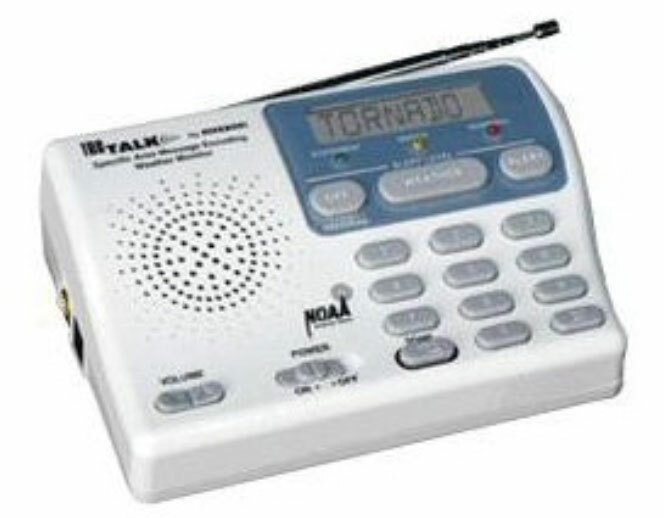 NOAA Weather Radio requires a special radio receiver or scanner capable of picking up the signal. Working with the Federal Communication Commission’s (FCC) Emergency Alert System, the NOAA Weather Radio is an “All Hazards” radio network, making it your single source for comprehensive weather and emergency information. In conjunction with federal, state and local emergency managers and other public officials, NWR broadcasts warning and post-event information for all types of hazards – including natural (such as tornadoes or earthquakes), environmental (such as chemical releases or oil spills), and public safety (such as AMBER alerts or 911 telephone outages). Weather radios equipped with special alarm-tone features sound alerts to give immediate information about a life-threatening situation. During an emergency, National Weather Service forecasters will interrupt routine weather radio programming and broadcast a special tone that activates weather radios in the listening area. Public safety experts agree that tone-alert weather radios should be standard equipment in every home. They are especially valuable in places that are entrusted with public safety, including hospitals, schools, places of worship, nursing homes, restaurants, grocery stores, recreation centers, office buildings, sports facilities, theaters, retail stores, bus and train stations, airports, marinas and other public gathering places. Can NOAA Weather Radios help people who have hearing impairment? Yes. NOAA Weather Radio offers nonverbal information imbedded in its broadcasts to provide timely, critical warnings of life threatening events to the hearing impaired. Some receivers are equipped with special output connectors that activate alerting devices such as vibrators, bed shakers, pillow vibrators, strobe lights and other alerting systems. Click on http://www.nws.noaa.gov/nwr/info/special_needs.html for more information. Implementation of additional NOAA Weather Radio (NWR) transmitters will continue to expand the nationwide network coverage. New digital technology (termed “SAME” - Specific Area Message Encoding) now allows lifesaving messages to be targeted to a specific area, like a county or portion of a state. Weather radios come in many sizes and with a variety of functions and costs. Most NWR receivers are either battery-operated portables or AC-powered desktop models with battery backup, so they can be used in the absence of commercial electric power. Where Can I Purchase a NOAA Weather Radio? What if I Have Additional Questions? Weather radios and receivers can be found at many retail outlets, including electronics, department, sporting goods, and boat and marine accessory stores. They can also be purchased via the Internet from online retailers or from manufacturers. Public Alert Radios are distributed to public schools to help safeguard students. With 24/7 capability, these radios are always on guard to alert school personnel to terrorist threats, emergencies and weather conditions in the immediate area, even when other communication lines are unavailable. Click here for more information.